During our stay in the Berkshires, we were able to paddle three ponds. 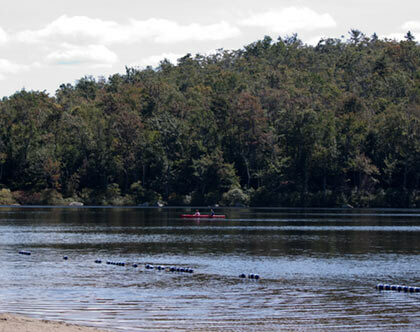 We used the book Quiet Water Massachusetts, Connecticut, and Rhode Island, 2nd: Canoe and Kayak Guide (AMC Quiet Water Series) to select places to paddle. We have found that the Quiet Water series is a very useful guide to paddling spots. I wish that there were similar guides for other locations. Because many of the paddling destinations are small lakes and ponds, they can be hard to find. The directions in the Quiet Waters books are very useful-- especially since our GPS often selected roads that were roads in name only. Upper Highland Lakein the Daughters of the American Revolution State Forest.